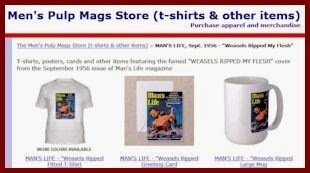 When I bought the August 1954 issue of Male magazine shown at left, with the superb cover painting of a rhino attack by artist Robert G. Doares, it reminded me of the book Even the Rhinos Were Nymphos, by a former editor of Male magazine, Bruce Jay Friedman. Today, Friedman is known as a critically acclaimed novelist, playwright and screenwriter. He’s the author of bestselling novels, such as Stern and A Mother's Kisses, popular plays such as Scuba Duba and Steambath, and screenplays for hit movies like Splash and Stir Crazy. Friedman’s book Even the Rhinos Were Nymphos is a collection of his non-fiction articles. The title story is a witty account of his pre-fame years as a men’s magazine editor in the 1950s and 1960s. Around 1955, Friedman was hired as an editor of Swank by the legendary men’s magazine and early Marvel comics publisher, Martin Goodman, owner of the Magazine Management company. 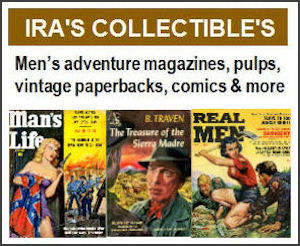 After a short stint at Swank, Friedman was moved over to edit the men’s adventure magazine Male, one of the most popular titles published as part of Magazine Management’s Atlas/Diamond Group of men’s magazines. At the time, the circulation of Male exceeded a million copies per month. It had talented staff writers like Mario Puzo (who later gained fame as the author of The Godfather) and used painted cover and interior art by some of the best illustrators of the day. 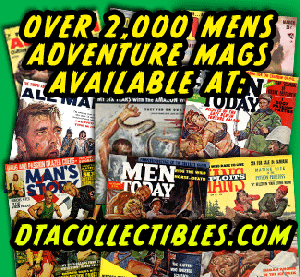 The formula used by Male was similar to that of other Atlas/Diamond Group men’s adventure magazines, like Action for Men, For Men Only, Men, Man’s World, Ken for Men and Stag. 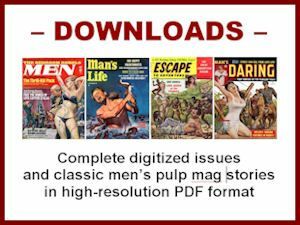 The August 1954 issue of Male has an “animal nibbler” story that is fishy in more ways than one. It’s about a diver’s fight with a shark titled “GIVE ME BACK MY HAND.” The shark is a nurse shark, a generally docile bottom dweller that only bites if harassed – as the one in the story is by the diver. The other notable fiction story is “Kovac’s Boy,” a touching Korean War tale by C.A. Rogers, illustrated by Vic Prezio. 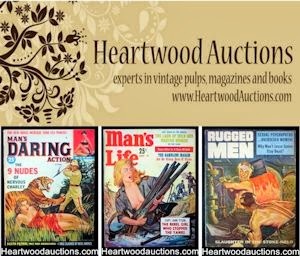 Prezio was a frequent contributor of covers and interior art to men’s adventure magazines. He’s also among the men’s pulp mag artists who also provided art for Warren Publishing’s classic monster fan magazines, Creepy, Eerie and Famous Monsters of Filmland.